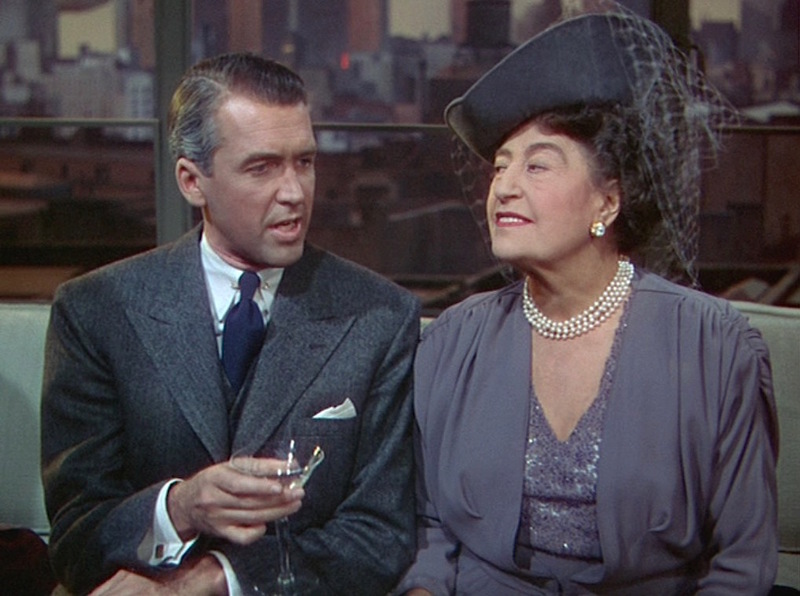 Just over 70 years ago on August 26, 1948, Rope premiered in New York City, nearly a month before it was released to screens around the country. With a story by Hume Cronyn and a screenplay by Arthur Laurents, Alfred Hitchcock adapted his experimental thriller from Patrick Hamilton’s 1929 play, itself inspired by the psychology of the infamous Leopold and Loeb murder case that shocked the world in 1924. John Dall and Farley Granger play the murderous young men who kill a former classmate they deemed inferior just to prove to themselves – and to the world – that they can commit “an immaculate murder”. 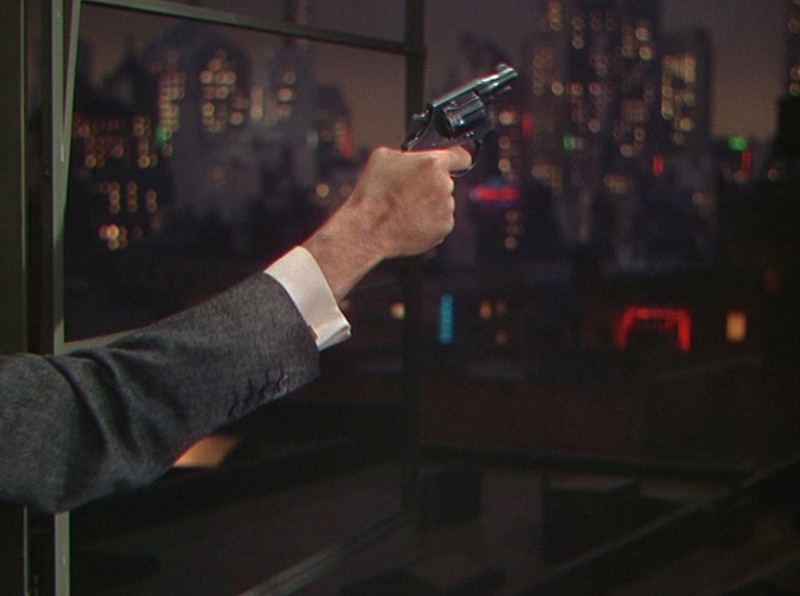 In his first of four collaborations with Hitch, James Stewart stars as the fellas’ former prep school headmaster with whom they’d discussed Nietzsche’s “superman” concept and the “art” of murder. Produced during the shining decades in the early 20th century often referenced as “the golden age of menswear”, Rope showcases elegant tailoring on each of its three leads. 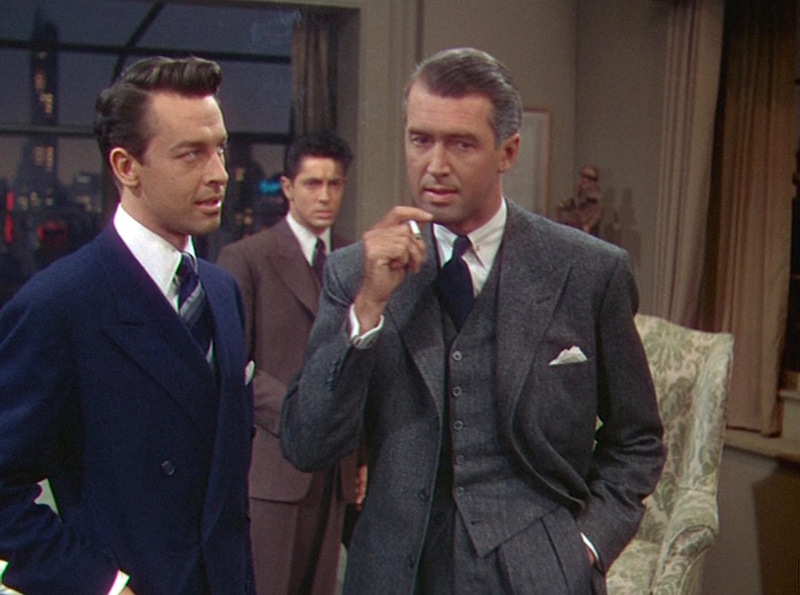 Bold peak lapels are the order of the day, from the double-breasted jacket of John Dall’s navy serge suit to the sharp and wide lapels on the single-breasted jackets of Farley Granger and Jimmy Stewart’s three-piece suits. Rupert’s gray tweed suit bridges the gap between the cool, calculating Brandon in navy serge and the anxious, earthier Phillip in his brown striped suit. While gray can have businesslike connotations, the tweed suiting brings Rupert’s ensemble “down to earth” and subconsciously presents his morality more in line with the less murderous Phillip. 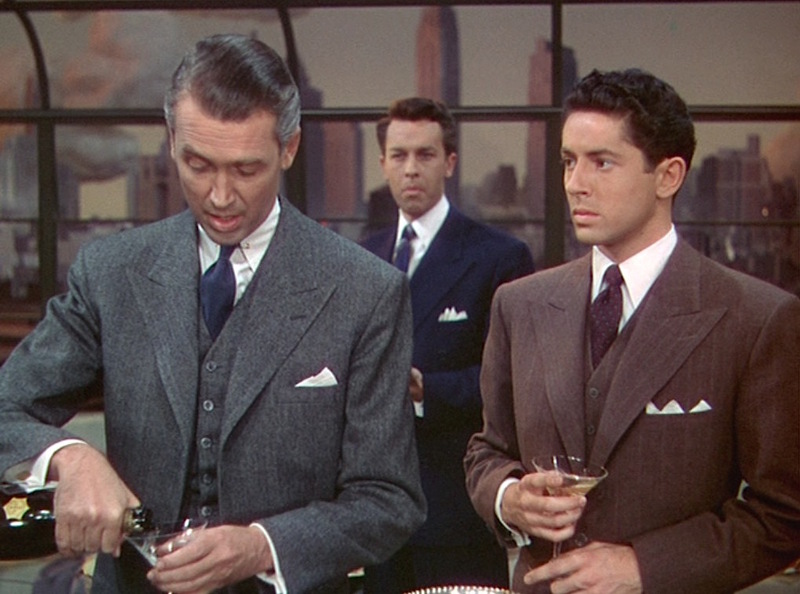 Stewart’s Rupert Cadell arrives at a dinner party hosted by Brandon Shaw (John Dall) and Phillip Morgan (Farley Granger), unaware that the two lads have just murdered a former classmate and are daringly storing his corpse in an antique chest that the food is being served from. Dressed in a gray herringbone tweed three-piece suit, Rupert’s party attire befits his professorial reputation and occupation. Gray is a good color for the former schoolmaster, reflective of his own moral “gray area” that led his former students to believe he would actually condone a murder committed by Nietzsche’s Übermensch. Rupert’s fine tweed suit is one I consider to be overlooked, though I was pleased to see that the blog Clued Down did include it in a list of the top 5 suits in cinema. The single-breasted, three-button jacket has wide and sharp peak lapels with a buttonhole through the left lapel. 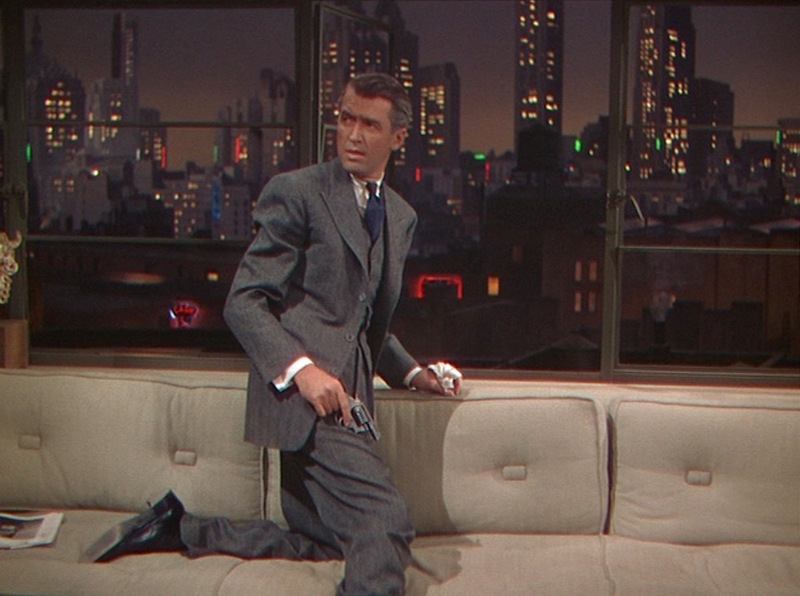 At 6’3″, James Stewart’s tall frame places him in the rare segment of the male population that not only can pull off a three-button jacket but also benefits from the visual balance offered by that third button. The ventless suit jacket has straight shoulders, a welted breast pocket for his white linen pocket square, and straight jetted hip pockets. The sleeves end with four kissing buttons that curve away from the sleeve vent as they extend down toward the wrist. Rupert’s slanted sleeve button formation can be seen as he slyly plants his gold cigarette case in Brandon and Phillip’s apartment. The single-breasted, six-button waistcoat is correctly worn with the lowest button left undone over the notched bottom. It likely has four welt pockets, though the draped chest of his suit jacket covers much of the clothing beneath it. Ideal tailoring during the 1940s meant that wearing a three-piece suit to a dinner party would keep the trouser waistband properly concealed under the waistcoat at all times. 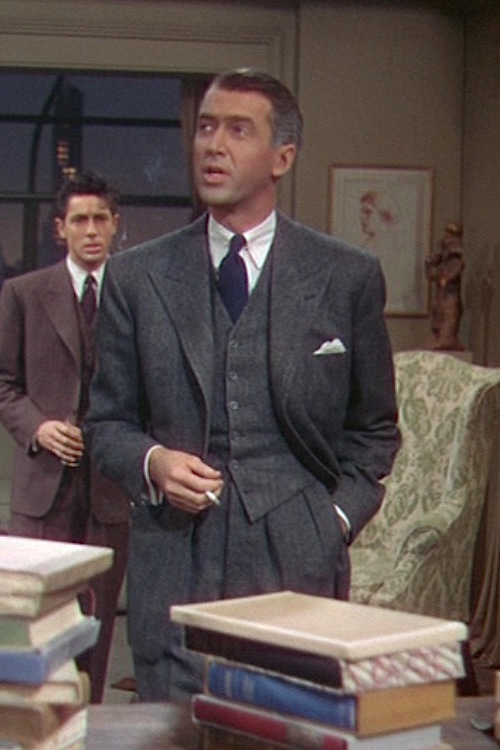 James Stewart’s suit is beautifully tailored so that the long rise of the trousers ends just above the lowest fastened button of his waistcoat, maintaining a harmonious flow. Though the proper fit of the jacket and waistcoat means we can’t be sure if he is wearing suspenders (braces) or has side adjusters, we can see that the full-fitting trousers have double forward pleats and are finished with turn-ups (cuffs) on the bottoms. 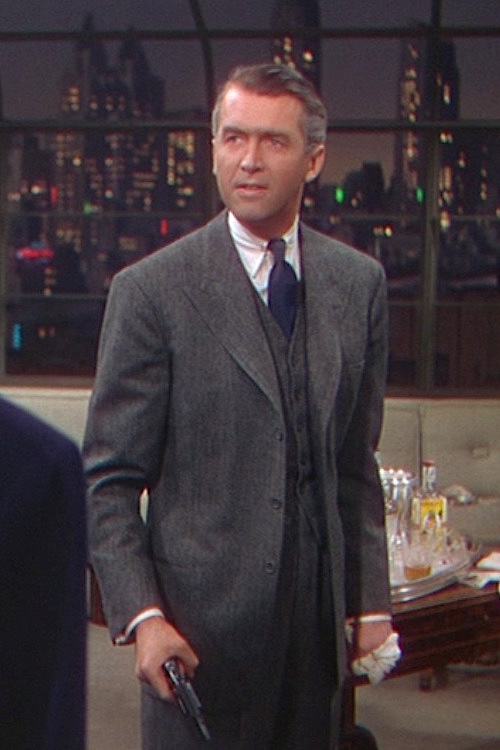 The full fit of 1940s tailoring was beneficial for a lanky guy like Jimmy Stewart, who would likely look like a lopsided string bean in the “skinny fit” suits of the 2010s. Rupert wears a white cotton dress shirt with a front placket and double (French) cuffs that are fastened with a set of flat gold rectangular links. The large point collar is elegantly accented with a classic gold bar that keeps his appearance neat throughout the evening. Rupert works his charm on Mrs. Atwater (Constance Collier). Rupert wears a navy tie made of finely textured silk, knotted in a neat four-in-hand that pops forward due to the shirt’s collar bar. Rupert makes an unfortunate discovery. Gray tweed works equally well with brown or black footwear, but attending a dinner party in an urban metropolis like New York City makes the latter a little more appropriate. Rupert thus wears black leather cap-toe oxford shoes with black socks, which are mostly covered by the full break of his trousers. Brandon and Phillip aren’t the type to demand their guests remove their shoes in the house, though they might have reconsidered this rule if they knew that Rupert would be stepping over the couch. However, most hosts would likely protest a guest firing a gun out their window before concerning themselves with whether or not said guest was wearing his shoes on their couch while doing so. Rupert’s subtle dress watch has a round yellow gold case and a light-colored dial and is worn on a russet brown leather strap with stitched edges. Rupert’s watch flashes from his wrist as he and Phillip struggle for control of Brandon’s discarded .38. Like any respectable gent in the city during the ’40s, Rupert wears a hat. In this case, it’s a gray fedora with a black grosgrain band. 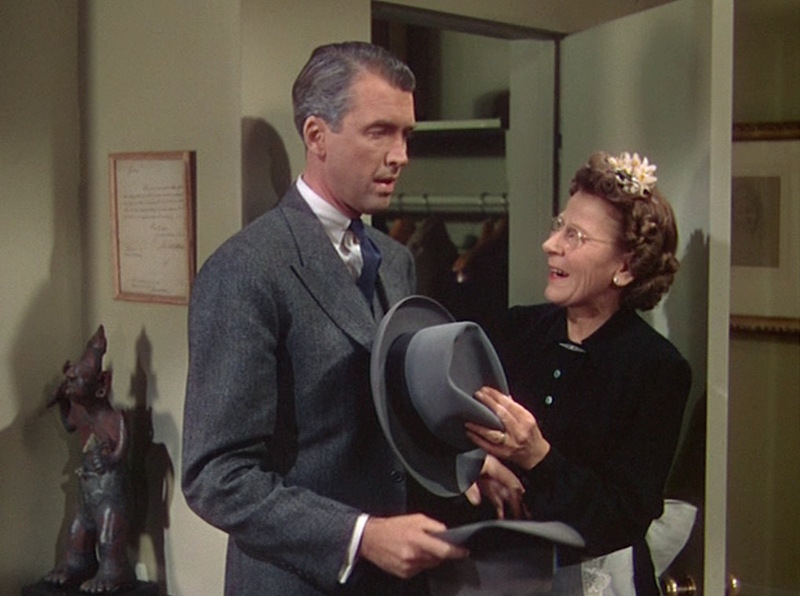 Brandon and Phillip’s kind housekeeper, Mrs. Wilson (Edith Evanson), helps Rupert with his hat. 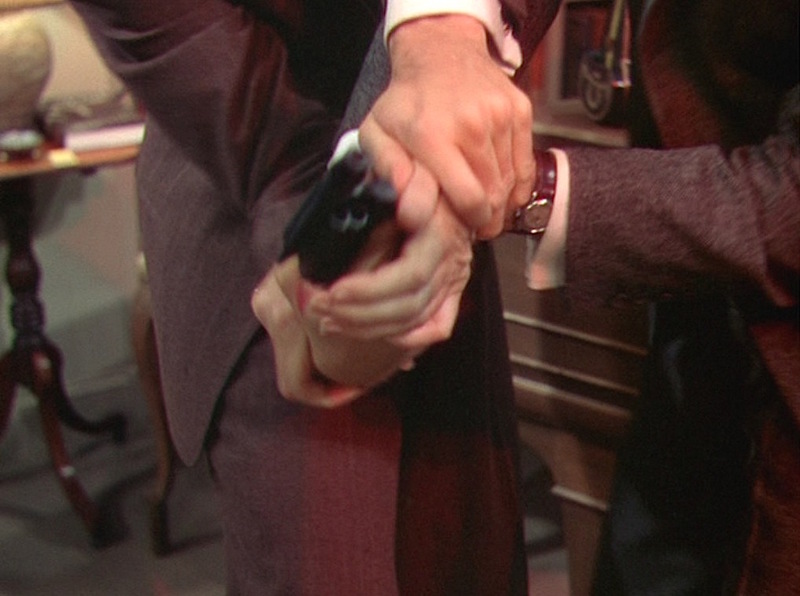 Brandon Shaw (John Dall) keeps a loaded Colt Detective Special in his pocket throughout the dinner party, perhaps as an extension of his thrill-seeking behavior. “That’s a gun, isn’t it?” Rupert asks, and Brandon sheepishly admits to arming himself to prepare for his trips up to Connecticut where burglars are evidently running rampant. 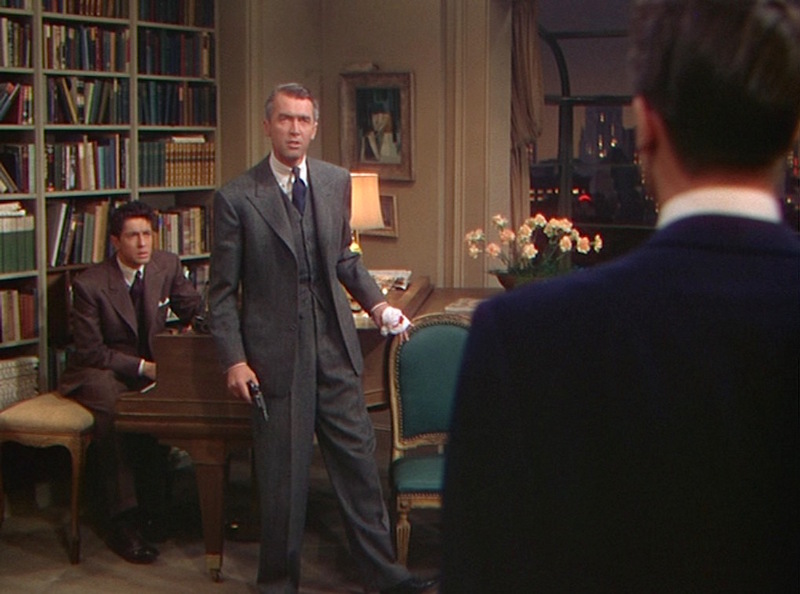 In a gesture of good faith, Brandon leaves the revolver on the piano, but his more emotional partner Phillip Morgan (Farley Granger) impulsively grabs it. After a brief struggle, a slightly wounded Rupert gets control of the weapon and fires three shots out the window to attract police. Rupert Cadell has his own way of calling 9-1-1, and it doesn’t even need a phone. The idea of carrying an all-steel .38 that weighs considerably more in your pocket may seem preposterous in the era of lightweight polymer subcompact handguns, but Colt had introduced its innovative Detective Special for just that purpose in 1927. Though pocket pistols had existed since the dawn of the revolver nearly a century earlier, the Colt Detective Special combined the power of the .38 Special round with the concealability of a 2″ “snub nose” barrel to deliver the first true mass-produced “belly gun” favored by cops and criminals alike. This is an occasion. It calls for champagne. Despite their haughty sense of superiority, Brandon and Phillip somehow make the mistake of outfitting their guests with the incorrect glasses, providing neither coupes nor flutes but stemmed cocktail glasses for their champagne. This wasn’t an uncommon practice a few decades earlier during the Prohibition in the United States, but it most likely would have been out of vogue by the late 1940s when the pair of murderers hosted their dinner party. Rupert makes no bones about having to drink his champagne out of an inconvenient glass. 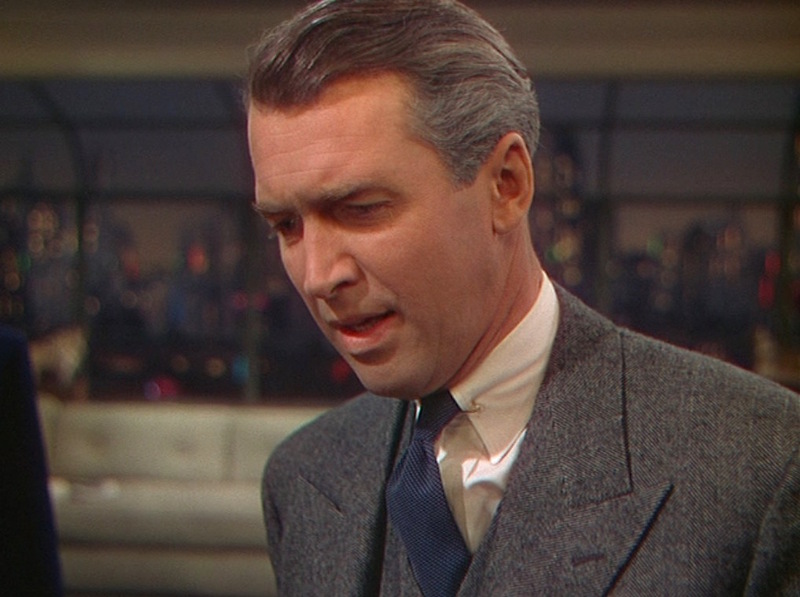 James Stewart looks every bit the professorial “Hitchcock hero” in his gray tweed three-piece suit, elegantly tailored for the times. In the spirit of this and the previous post about Henry Fonda’s white dinner jacket in The Lady Eve, fans of classic Hollywood should check out Hank & Jim, Scott Eyman’s fantastic and insightful book released last October about the five-decade friendship of Fonda and Jimmy Stewart. After all, murder is – or should be – an art. Not one of the “seven lively”, perhaps, but an art nevertheless. And, as such, the privilege of committing it should be reserved for those few who are really superior individuals. Astrological enthusiasts might appreciate the loquacious Mrs. Atwater’s accuracy when exploring the sun signs of movie actors, declaring the “sinister” James Mason to be a Taurus (born May 15, 1909), Cary Grant to be a Capricorn (born January 18, 1904), and Ingrid Bergman to be a Virgo (born August 29, 1915). When Phillip Morgan replies that his birthday is July 14, she astutely concludes: “Cancer, the crab… moon child”. While actor Farley Granger, who portrayed Phillip, was also a Cancer, his birthday was July 1. 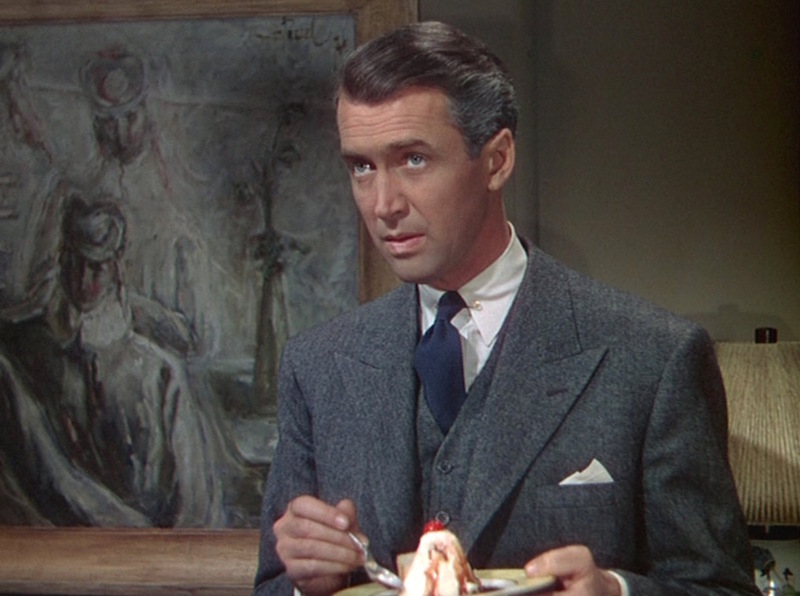 (James Stewart, born May 20, 1908, is a Taurus like Mr. Mason, and John Dall’s May 26, 1920, birthday thus makes him a Gemini.) 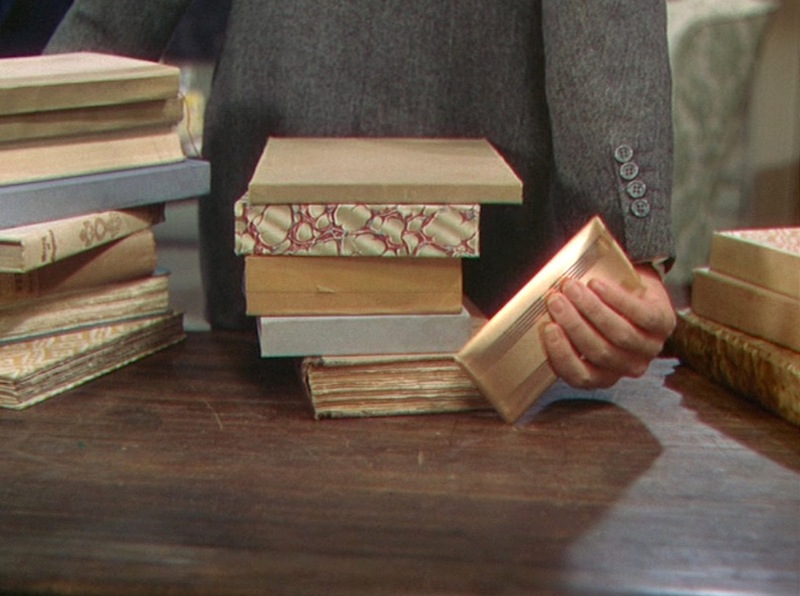 Evidently, Hitch was quite enamored with the concept of astrology at the time, as his subsequent film – coincidentally starring Ingrid Bergman – was titled Under Capricorn. Yours truly is also a Cancer, born on July 21. From what I understand about the traits of my shared sign with Mr. Granger, it is an apt sign for me. John Dall is who I envisage as Tom Ripley when I read the Patricia Highsmith novels. Must be the whole urbane, dinner party throwing sociopath thing.